QLaserOn laser guided motion control system is used at shipping port terminals for automated container movement and truck-crane alignment with efficiency. QLaserOn can be integrated with any existing or new crane control system. We provide complete hand holding support in system implementation. The movement of trolley and spreader is guided using laser sensors generating dynamic container stack profile and automatically locating trolley and spreader positions. 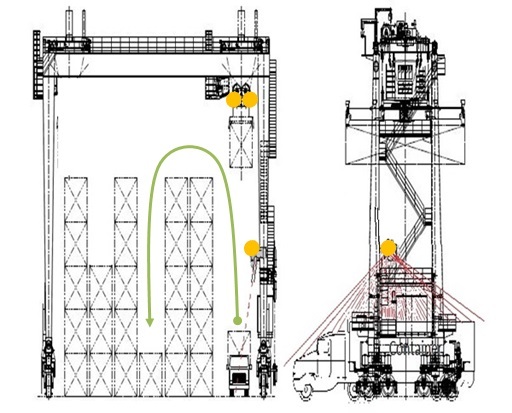 This results in a self-checking highly autonomous container loading and unloading system. Traditional gantry cranes are operated manually with operators driving the crane sitting in the trolley at crane top. This leads to container yard inefficiencies in terms of number of operations, placement of containers in a haphazard manner and concerns for collision during container movement. Additionally, alignment of trucks for loading and unloading the containers is a major challenge. With QLaserOn, the operator moves to control rooms operating the crane remotely. With two laser profile sensors for trolley and spreader movement control during container loading, unloading and collision prevention; one laser profile sensor to assist in gantry operation and preventing collision against adjacent stacks; one laser profile sensor for truck position control coupled with high speed real time (RT) controllers for sensor data processing; QLaserOn controls tire as well as rail mounted gantry crane container movement and assists in truck positioning. Feel free to contact us. We will be keen to assist you in making your container terminal future ready. © 2019 - Quantum Age Tech Solutions Pvt. Ltd.